With Gareth Southgate’s men reaching the semi-finals in Russia over the summer, and drawing The Netherlands in the UEFA Nations League semi-finals, anticipation for the future of the English football could not be higher. On top of this, it seems like the next set of English youngsters could propel the national side to even greater achievements, with latter stages of major tournaments being reached at all levels of the English set up. However, the international feats of many of these players is not being replicated for their domestic clubs. With the explosion in foreign talent being brought into the Premier League it is clear to see that young English talent is being ignored. One of the most notable and recent examples of this is that of Callum Hudson-Odoi. Odoi was part of the England under-17s squad that reached the final of the 2017 European Championship, scoring in the final as England lost on penalties to Spain. With Odoi starring at the under-17s level and a with bright future ahead of him, it seems ludicrous for Chelsea to now be on the brink of buckling under the building pressure from Bayern Munich to sway him towards the Bundesliga. Speaking in 2017, Dermot Drummy, an experienced academy leader at both Chelsea and Arsenal, said, “it comes from the owners. If Chelsea owner Roman Abramovich said to Antonio Conte, ‘push the youth players, don’t worry about results for a few seasons’, they would come through. “But you won’t break the cycle until that happens”. The drive for instant trophies and marketing success is showed by Chelsea’s decision to sign 20-year-old Christian Pulisic from Borussia Dortmund for a huge sum of £58 million, while Callum Hudson-Odoi remains sat on the bench. Odoi could be following in the footsteps of an increasing number of young Englishmen that are diverting their immediate careers away from the Premier League and towards foreign shores, mostly in Germany. The most notable of these is Jadon Sancho. 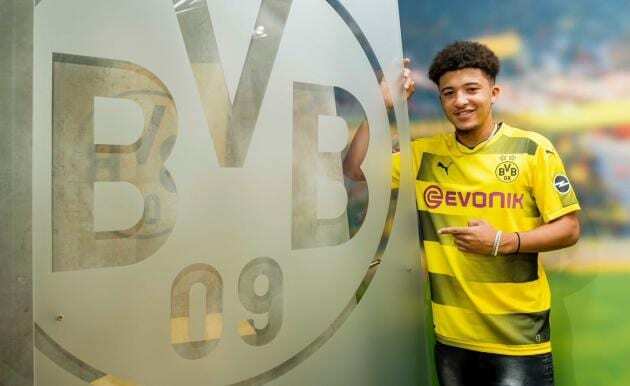 Sancho won player of the tournament in the 2017 under-17s European Championship, as well as lifting the under-17s World Cup in the same year. After losing confidence in his playing time at Manchester City the skilful winger forced an £8 million move to Borussia Dortmund. Sancho has grabbed the headlines ever-since, scoring 5 and assisting 6 in the Bundesliga alone this season. Sancho and Hudson-Odoi are not the only young players being looked at by the Bundesliga and Europe’s other top Leagues. Arsenal’s Reiss Nelson is performing well at Hoffenheim while Manchester City’s Patrick Roberts is at Girona. It seems foreign clubs have grown wise to the pool of unused and frustrated English youngsters and have turned their scouting attention towards the English youth setups. Notable players under serious interest include West Ham’s Reece Oxford and Fulham’s Matt O’Riley, showing that the problem runs far deeper than just the ‘top 6’. The situation is typified by the recent statement of a director of football at a Ligue 1 club: “we can’t believe some of the quality English clubs have and don’t use.” Proving that much of the continent has turned its attention to fresh English talent that is not being given first team football. As mentioned, the last two years has seen the under-17s both win the 2017 World Cup and reach the final of the 2017 European Championship. These competitions saw Phil Foden shoot into the media headlight due to his performances. Foden has been tipped for greatness, but only making 8 appearances, with many from the bench, so far in the 2018/19 Premier League season, may have a detrimental impact on his development and could see him fall behind the likes of Sancho who are staring more regularly. A saviour, perhaps, is the influence of the Manchester United duo Marcus Rashford and Jesse Lingard. The pair, especially under Ole Gunnar Solskjær, have come alive and are proving that it is possible to reach the top level by staying in England. However, one doesn’t even have to leave Manchester United’s youth setup to find another example of a young player using other European leagues on their path to the top. Paul Pogba used Serie A giants Juventus to continue developing his skills before returning to the Premier League and Manchester United for a record breaking £89 million. With the England under-20s and under-19s also achieving major tournament success since 2017 it would be a tremendous misjudgement by Premier League clubs to continue allowing developing players to go abroad in order to gain first team experience at the right level. Players such as Dominic Calvert-Lewin and Dominic Solanke were instrumental in the under-20s World Cup victory in South Korea. Solanke’s recent £17 million move to Bournemouth shows just how indispensable these players are to the Premier League. On the one hand, the onus is on the managers of Premier League sides to avoid using their under-23s squad only in the Carabao Cup and Europa League dead-rubbers. It is also to stop from loaning potential talents to extremely low-quality outfits that stunts their growth as top end players. On the other hand, it is the responsibility of the clubs’ board members and owners to give the managers opportunity to experiment with their young players in the Premier League, rather than simply favouring big money transfers and executive profitable decisions. Although the Premier League may be dwindling in chances for these young English players, it is evident by the major tournament triumphs that their quality is still improving year by year. As foreign scouts have begun to notice this, the English national side may have an increasingly strong pool of players, that just so happens to be playing its football on the continent.